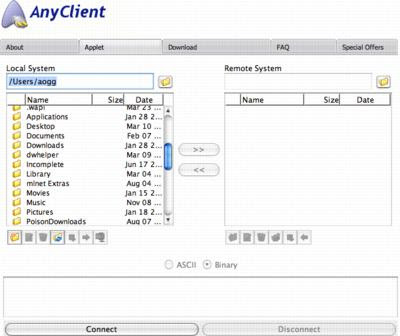 AnyClient is a free, platform-independent, file transfer application that supports all major file transfer protocols including FTPS, SFTP and WebDAV/S. AnyClient is available both as a Java web-based service requiring no software installation and as a downloadable application for Mac OS X, Linux and Windows that you can install locally. The Java-based version looks very similar to most stand-alone FTP clients and can even save your FTP server settings via cookies if you wish.